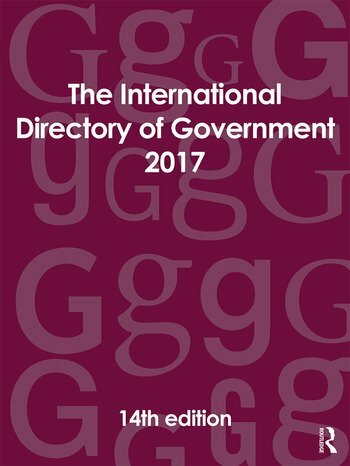 The International Directory of Government is the definitive guide to people in power in every part of the world. All the top decision-makers are included in this one-volume publication, which brings together government institutions, agencies and personnel from the largest nations (China, India, Russia, etc.) to the smallest overseas dependencies (Guadeloupe, Guernsey and Christmas Island, etc). Institutional entries contain the names and titles of principal officials, postal, e-mail and internet addresses, telephone and fax numbers, and other relevant details. - details of important state, provincial and regional administrations, including information on US states, Russian republics, and the states and territories of India. Explanatory Note. Abbreviations. International Telephone Codes. Part 1: Country Chapters Afganistan - Zimbabwe.